In recent years, Alzheimer’s disease has been increasingly recognized as a disorder with complex etiology and multiple pathogenesis pathways. Learn about innovative techniques being using at Banner Health from senior scientist Yi Su, Director of Computational Image Analysis Lab within Banner Health. Alzheimer’s disease is the leading cause of dementia and a major burden to society. Despite numerous efforts and considerable support, no disease-modifying therapy is currently available to treat and prevent AD. In this talk, Su reviews AD and common imaging techniques used in its research. Neuroimaging provides important information about the brain that can advance research and drug development efforts. Then he will discuss the three areas of his current research: developing quantitative image analysis; developing imaging biomarkers; and understanding the genetic factors of AD. 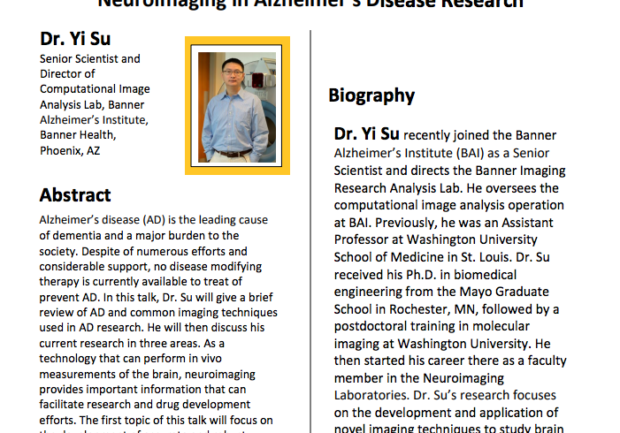 Yi Su joined Banner Health as a senior scientist and direct the Banner Imaging Research Analysis Lab, where he oversees computational image analysis operations. Previously he was an assistant professor at Washington University School of Medicine in St. Louis. Su received his doctorate in biomedical engineering from the Mayo Graduate School in Rochester, MN, followed by a postdoctoral training in molecular imaging at Washington University. 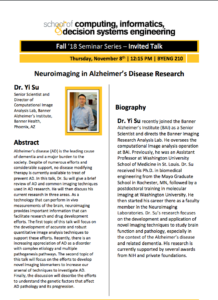 His research focuses on the development and application of new imaging techniques to study brain function and pathology and has been supported by several awards from NIH and private foundations.